[handwriting]: J. Henry Knight, June 13/94. 108-Portland, misc. [stamp]: J.H. Scotford, 5th. Street. Bet. Morrison and Yamhill Streets, Portland, Oregon. Description Scanned as B & W. Written on front: Episcopal Church 1 Block North. 6 & Stark, looking north. 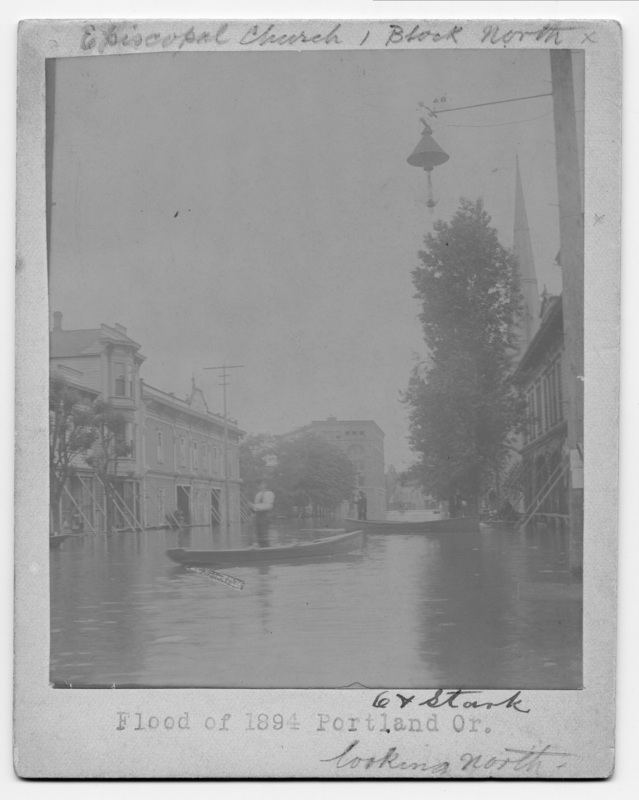 Flood of 1894 Portland, Or. Transcription [handwriting]: J. Henry Knight, June 13/94. 108-Portland, misc. [stamp]: J.H. Scotford, 5th. Street. Bet. Morrison and Yamhill Streets, Portland, Oregon.